Nearly 30 invitees representing seven of nine local partner organisations currently participating in the International Physicians for the Prevention of Nuclear War joint Zambia-Austrian Victim Assistance and Violence Prevention and Mitigation Clinic Project (VCP) converged on Lusaka’s University Teaching Hospital In-Service Training Centre to discuss results of a 5-month Phase I stage of the VCP. The aim of the VCP is to study the problem of interpersonal violence (IVP) in Lusaka and assess whether improvements should or can be made in linking medical and social services that impact and influence the outcome of prevention and mitigation measures, including primary and secondary prevention. Phase I was intended to gather baseline information on IVP injuries seen at the hospital emergency room and to recruit local Zambian partners. These partners include the Young Women’s Christian Association (YWCA), the National Council of Catholic Women (NCCW) in Zambia, the Zambian National Women’s Lobby Group (ZNWLG), The University Teaching Hospital (UTH)’s Accidents and Emergency Department, the University Teaching Hospital’s Department of Social Counseling, and the Zambia Society of Physiotherapists (ZSP) who all attended the meeting. 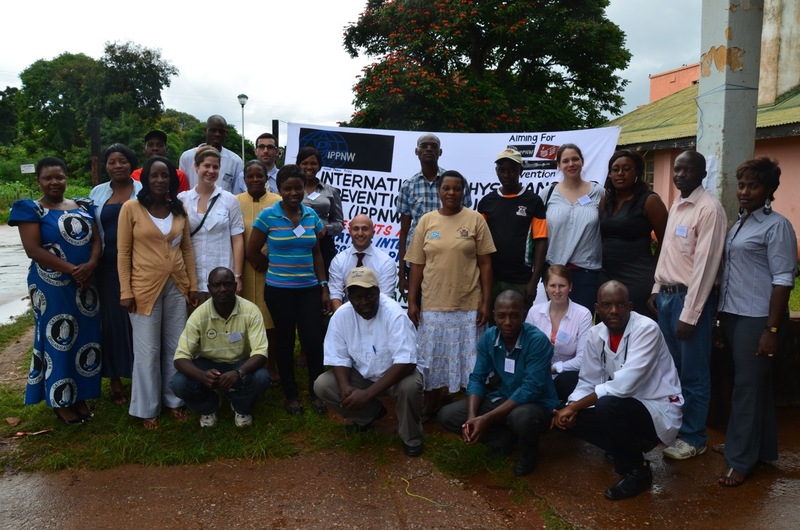 The project was initiated by Zambian Health workers for Social Responsibility (IPPNW-Zambia) and IPPNW Austria, with over 35 medical students and a number of physicians from both affiliates participating in the project. The Zambia Police Service’s Victim Support Unit (VSU) and the Legal Aid Clinic, two vital cogs of the project, were not represented for logistical reasons. (d) What linkages exist, if any, between organisations dealing with interpersonal violence in Lusaka? In achieving the stated ends, an approach to the issue of integrated care was taken which revolved around interviewing and working with key staff in the aforementioned partner organisations. This was done via questionnaires and direct personal communications. The one-day seminar, under the theme Towards integrating interpersonal violence victim assistance programmes in Lusaka provided an opportunity to disseminate the data collected to date and discuss the way ahead. A review of the data showed that interpersonal violence was common in Lusaka and that a number of players including health providers handled various and interconnected facets of the problem. It also came to light that partner organisations sometimes refer clients between and among themselves and yet do not coordinate their work thus making it difficult to measure the combined anecdotally positive and re-enforcing benefits to the outcome of treatment of victims of anti-personal violence. The participants learned a lot from each other and were surprised at the amount of data collected at the UTH’s ER. They coveted the data so collected in that they felt it would enhance their work. The partners also found the information very informative, simple and well presented. A discussion then followed that evaluated the study protocol, the data collecting instruments and the outcomes. Many partners felt the clinical data collection instruments used were equal to the task. They were surprised that 121 (62 males and 59 females) cases were collected in such a short period of time. The partners however suggested adding questions to the instruments for collecting data from partner organisations, standardizing referral letters and creating a periodic consultative forum where data would be jointly evaluated and measures taken to improve or make the project responsive to the needs on the ground. Draft common Posters, information leaflets and contact information cards were agreed upon with relevant modifications and designs. These information sources will be placed in the hospital and with all partner organisations to help clients reach the services easily. A final resolution was made for all partners to work as one with the possibility of designating a common room at the UTH to serve as a meeting and coordinating center of partner organisations. Dr. Mtonga is IPPNW Co-President and Local Project Manager of the VCP.